Hello, and welcome to the website of Richard Lanning Builders, Inc. We are a custom home building company specializing in fine homes with craftsman quality details. My name is Richard Lanning and I am the president of the company. I am a life long native of Waynesville, N.C. I grew up in a family that was supported by home building as my father was a builder. I graduated from nearby Western Carolina University. My wife and I decided to raise our family here in Haywood County where the scenery is beautiful and the people are friendly. As president of Richard Lanning Builders, Inc. I oversee and am directly involved in all of the day to day operations of the company. Other employee structure includes an office manager, a project manager, field crews and subcontractors. Each of my team members is keenly aware of the builder-client relationship that develops and is nurtured throughout individual projects. We pay great attention to detail regardless of the size or scope of the job at hand. It is our intention to treat each of our clients with dignity and courtesy. We strive to produce the best product possible, at the lowest cost, in the shortest period of time. Our mountain values are strong and our goals are high. So come and visit us and spend some time getting to know us and what we are about. Hopefully, a successful business relationship will result in a lasting friendship. "A great experience with wonderful people. Richard made building a house via long distance simple. There were no surprises and everything turned out better than expected. Richard and his team are well organized and his connections with subcontractors (tile, appliances, etc.) made the process easy. 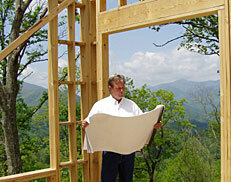 We'd highly recommend Richard Lanning to anyone building a home."